I got to stay with a warm family full of joy and love in very big and nice house. I got to know God and go to church. I love my CFPM family. Su-nee came stay with Child and Family Prison Ministry (CFPM) in March of 2009. Her father is in prison with a life sentence. Su-nee’s mother left her when she turn one month old to fend for herself, so Su-nee had to stay with her old grandmother. 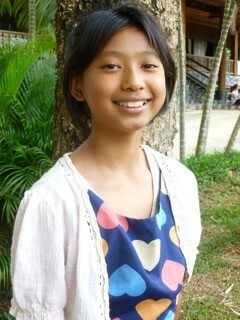 Su-nee was very guarded and closed when she first came to the foundation. The dentist took about two years to help with her oral problems with the cavities because her grandmother fed her with sweetened condensed milk. Su-nee had a lot of problems with nutrition. But now she is very happy and healthy. Su-nee also loves to read books, she does very well in school. This is Su-nee after many years with her CFPM family. The picture of Su-nee above is of when she first arrived at the ministry. I like this story because Noah obeyed God and he is a good example for me to follow. But my favorite Bible verse is, "And a voice from heaven said, 'This is my Son, whom I love; with him I am well pleased'" (Matthew 3:17). This Bible verse is important to me because I’m a child of God, and I know that God loves me so much. Right now I am 13 years old. I am in grade 8. I like to read books. I want to be a writer. My favorite colors are green and orange. My favorite food is Thai noodles soup. Su-nee is one of many children in Thailand whose parents will be locked in prison either for life or long enough that the children will be adults by the time they are released. It's a tragic reality, but because of the work of CFPM, this rough beginning doesn't have to endure throughout the kids' lives. The kids learn about Jesus through faithful CFPM families and they are nurtured physically, emotionally, mentally, and spiritually. This ministry needs your prayers to continue the work they are doing. Would you let us know you're praying for them by subscribing for the latest updates and testimonies?